The glacial fjords are a protected wilderness area and we would need permission to gain entry. My step-brother, the infamous fisherman extraordinaire Gary Cole, joined Marie and myself in Hoonah for a month of carefree sailing and we decided to head north across the Straights. It was easy enough except for the fierce tides at the entrance. There, under a reefed mainsail and jib, with a brisk westerly wind across our beam, we cautiously made our way through the treacherous Sitakaday Narrows – watched suspiciously by large numbers of sea otters and grey seals nosey enough to come and see what we were about. Of course, there were the usual humpback whales blowing sea spouts along the shorelines and majestic bald eagles soaring all around us too. We had been instructed to call the somewhat isolated Park Ranger station on the VHF radio and they gave us very specific instructions of what we could and couldn’t do… and where we were not allowed to go! And so, in the fading daylight of these long northern days, we made our way to Shag Cove deep within Geikie Inlet to anchor for the night. There we found a long narrow indent in the shore with a fast flowing creek and a waterfall at its head and spectacular mountains either side of us. Whilst settling Sänna down for the night I briefly spotted a black bear poking around on the shoreline nearby… it quickly disappeared into the trees with a backward glance before my two sceptical crew members had chance to view it. The next morning, after Marie cooked up a bacon and egg breakfast using the last of our still fresh bread, we drew our anchor in glorious sunshine and motored northwards by following the main Glacier Bay Inlet to take us deep into the depths of the high St Elias mountains. We’d struck lucky with the weather too… most visitors to the region find low lying fog with incessant grey summertime rain, the prevailing weather here in Alaska. Auspiciously, before long, we began to encounter ice in the sea. In small drifts to begin with that soon turned into worrisome amounts of more continuous but still broken flows. The bergs we found appeared to be calving from the huge John Hopkins Glacier and we would have to force our way through the barrier confronting us if we were to make any progress. It was easy enough really, to begin with, and we slowly forced our way ahead – but I was acutely conscious of our unprotected propeller and any hard impact against our hull. I kept our boat speed low. With our safety in mind Marie and Gary strategically positioned themselves either side of Sänna’s bows with our long boat hooks to push away the troublesome larger flows. In this manner we gradually inched our way through to reach a channel behind Russell Island where we found much less drifting ice and the flows diminished. Leaving bothersome John Hopkins Glacier and its ice field behind we made faster progress northwards into craggy Tarr Inlet and I relaxed more easily on the helm. Along the way we passed the retreating Rendu and Reid Glaciers and saw numerous other glacial fields with still heavy snowfalls higher up the mountain range. This was grand. And all the time the changing sea colour made a lasting impression on each of us. Now free of the ice flows the water became a wonderful turquoise… a result of the mineral content of numerous melting glacial bergs. And the wildlife grew in spectacular fashion as well… ubiquitous numbers of sea otters all rafted together on their backs whilst holding ‘hands’ and staring unceremoniously in our direction. Maybe they were curios or simply objecting to our intrusion. Once again, along the shoreline, the spouts of uncountable humpback whales slowly raising their huge fin tails out of the sea before making their majestic sounding dives. To all three of us, mesmerised like innocent children messing around under wide deep blue skies, this was an unforgettable experience, the incredible silence dreamlike and difficult to describe. By late afternoon, with no wind to disturb the flat calm sea, we’d made over thirty miles progress north to reach Margerie Glacier, the jewel in the crown of Glacier Bay’s fjord wilderness. This ferocious mile wide slab of moving ice snakes twenty seven miles from the monstrous fifteen thousand feet Mount Fairweather located in Canada’s nearby Yukon Territory, to end itself by breaking up in thunderous cracks and falling with huge towering chunks into Tarr Inlet. I let Sänna drift along slowly and serenely in the sunshine under no power… but wisely kept our distance. A sudden collapsing ice tower would cause a local tidal wave that could overwhelm us. 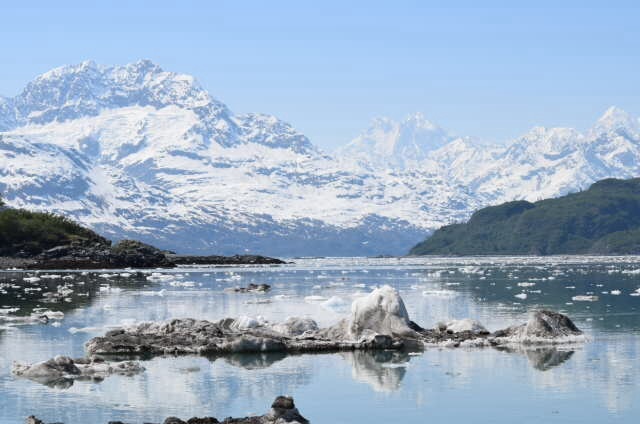 Just over the high ridge to the north, still unseen, lay the magnificent Grand Pacific Glacier which history tells us formed Glacier Bay itself. Conscious of our need to somehow find a safe anchorage for the night, and that we’d again have to force our way through the floating ice barrier, we turned south and left Margerie Glacier behind. We had the advantage of long daylight and the late setting sun but we still had a long way ahead. The ice field would surely delay us and we’d be lucky to anchor except maybe in twilight. I had no wish to traverse back through the barrier ice in the dark either. But luck was on our side. By keeping close to the shoreline the tidal currents had dispersed the berg ice just enough to give us a reasonably clear passage through, but I had to keep a close eye on rapidly receding depths and any sudden breaching humpback which could break through Sänna’s hull with impunity. I well remembered Ken’s warning words in Hoonah about their own sinking by a whale. With perseverance Gary had found us a possible anchorage on the charts that we could reach. We made for Blue Mouse Cove. It would be a long drag south on the engine but the ease of traversing the ice field meant that we’d probably be on anchor before nightfall. And so it was. Whilst Gary and I piloted our way across Glacier Bay Inlet towards the anchorage Marie prepared a hot supper in her special way so that we could dine in some style once our anchor was set. Entering Blue Mouse Cove was easy going and I manoeuvred the helm around looking for a suitable depth to drop our hook. It was calm and windless so we’d surely have few problems overnight. Once settled, we relaxed with a couple of Alaska’s Pale Ale beers for Gary and me whilst Marie downed her precious Newcastle Brown Ale. We dug hungrily into Marie’s lovingly prepared late evening supper. And then, to complete the magnificent day, as starlight slowly descended, a large and well weathered brown grizzly bear meandered along the beach only yards away with its nose in the air. Undoubtedly it was attracted by the delicious smell of cooked food which, on this occasion, consisted of chicken baked with apricots and rice. He paused and studied us for a good while and I suddenly recalled in the back of my mind that grizzly bears are noted swimmers. Soon, after some deliberation, he turned and ambled off to find his own supper deep in the forest. The next day we’d try and find a secluded inlet where we could go ashore and, maybe, with our ludicrous taser to protect us from Grizzlies, find the semblance of a trail to explore inland. Instead, we found the secluded ranger station in Bartlett Cove and anchored off. Other vessels were anchored there too, but not enough to disturb the tranquility and remoteness of Alaska’s spectacular jewel.